While the rib and loin sections of beef produce some of the best steaks, they're also some of the most expensive cuts of meat. For a cheaper alternative, a good choice is a chuck. The meat tends to be tough and is usually used in stews, braised dishes, slow cooking, and pot roasts, but some chuck steaks are great for grilling. Chuck steak is a cut of beef that is part of the subprimal cut known as the chuck. The chuck primal sits above the rib primal and includes the shoulder. The top blade section is desirable for grilling because it becomes very tender once the gristle is removed. There are a number of intersecting muscles that can cause the grain of chuck meat to change several times in a single cut. Being mindful of this will help you to select and carve these cuts. Chuck steaks require a little more prep than more expensive cuts, but the value makes them worth the effort. You can prepare a delicious chuck steak in the oven or slow cooker, but some cuts are great for grilling. Just remember, the more you grill a steak the tougher it will get, so try to stay at medium or medium rare to achieve a tender result. What Does Chuck Steak Taste Like? The fat and gristle that make this meat so tough and chewy also make it flavorful. But some find chuck steak needs a good marinade to add more flavor and tenderness. While they come from the same area of the cow, chuck roast and chuck steak refer to different cuts. Chuck roast is a tough cut of meat that often includes part of the blade bone, and is cut in a cylindrical or oblong shape in which the grain runs in the same direction as the long side of the meat. Chuck steak is that same piece of meat but cut into one- to three-inch-thick slices. Chuck Eye Steak: This steak is cut from right next to the rib eye steak. This is a perfect steak for grilling and can go from the package to the grill with just a little salt and pepper. Shoulder Top Blade: Also known as the flat iron steak, this is also a perfect steak for the grill. A tender steak, its characteristic marbling gives it plenty of flavor. Shoulder Center or Ranch Steak is tender and generally has less fat than other chuck steaks, so the flavor might be a little light. Try brushing this steak with olive oil, sprinkling with salt and pepper, and adding some basic herbs like oregano to bring out the flavor a little more. This is a thinner steak so watch it closely to prevent overcooking it. 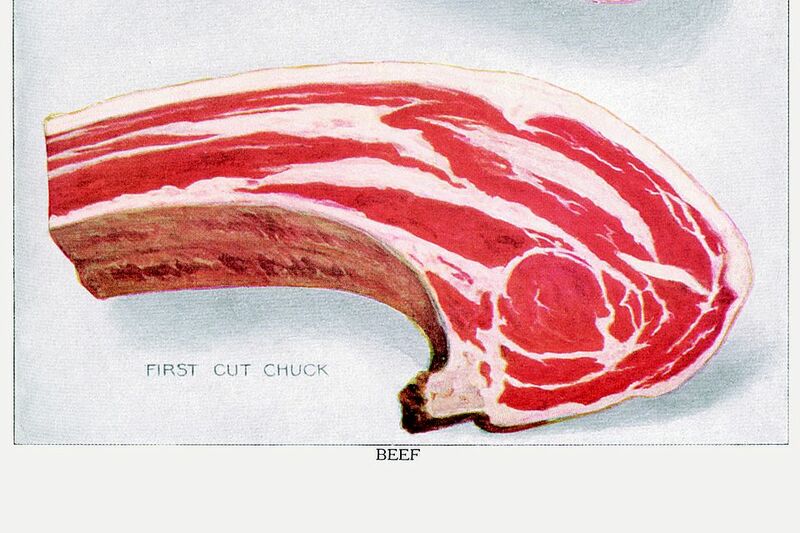 Shoulder Petite Tender or mock tender steak comes from the point of the chuck primal next to the top blade. While generally a flavorful little steak, this cut definitely needs a good marinade if you intend to grill it. Chuck Steak is cut from next to the chuck eye steak but lacks the tenderness of the chuck eye. This steak needs to be marinated before you cook it to get it tender. While still a flavorful cut of meat this isn't one of the best steaks for the grill. Shoulder Steak: Like the chuck steak, this is a tougher cut of meat and should be marinated before grilling. This steak is better used when you plan to cut up the meat for dishes like fajitas. You can find great chuck steaks at the supermarket or warehouse club, but it's always best to talk to a butcher if you have any questions about the meat you are buying. The price of a steak (per pound) is determined largely by the quality of the cut—the better the steak, the more you pay. Butchers typically wrap meats in brown or white paper but if you buy steak off the shelf at the supermarket, it usually comes with an overwrap of oxygen permeable film, called "modified atmosphere packaging." Carbon dioxide gets pumped into the package, which helps to slow microbial growth and keep the meat's red color. Whichever way your meat is wrapped or packaged, it's best to leave it in the packaging until you're ready to cook it. With proper refrigeration (40 F or below), beef lasts 3 to 5 days. If your freezer is set to 0 F or below, you can store fresh cuts there, too; just be sure to cook and enjoy them within a year.